Today we are pleased to announced a new partnership to bring OTOY’s end-to-end rendering and publishing technology to Facebook’s revolutionary new Surround 360 x24 and x6 cameras that are world first accessible capture platform with six-degrees of freedom (6DOF). We’ve been working with the very talented Facebook Surround team to provide a revolutionary artist friendly toolchain for fully immersive volumetric storytelling. This breakthrough has long been a goal of the VR community, and we are so excited this day has finally come. Our collaboration allows millions of content creators to work with volumetric video footage across the full ORBX ecosystem of 28 different authoring and editing tools. 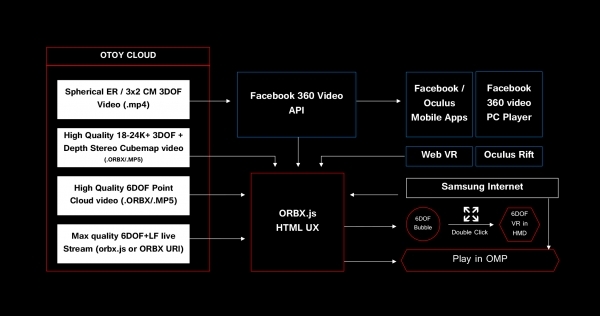 We’re then bringing OTOY’s cloud rendering and light field streaming service to deliver final Surround 360 content with universal playback of interactive mixed reality media across all major platforms and browsers. It’s a simple and powerful publishing solution this game changing camera deserves. The X-24 and X-6 cameras are planned to be released in 4Q 2017. Stay tuned for many more announcements coming in the weeks to come. For more information about the partnership, see the F8 announcement here and read about it on Upload VR.